With 3D Touch on Apple's iPhone 6s and 6s Plus, users can enter iOS 9's multitasking app selector view with a simple swipe, a much more intuitive process than double-clicking on the home button. 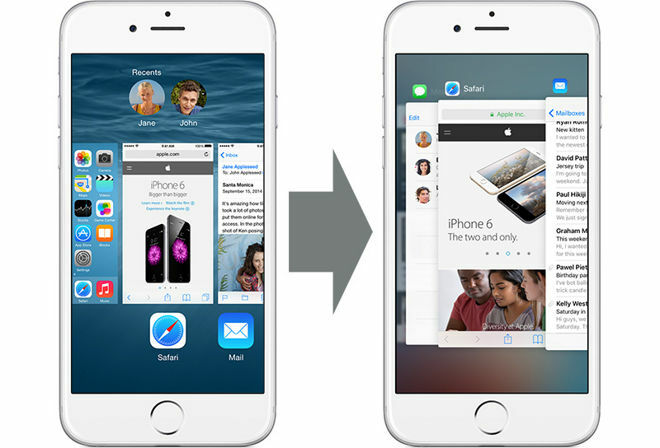 Multitasking in Apple's iOS 8 (left) and iOS 9. The new pressure-sensitive multitasking function is enabled by default on Apple's iPhone 6s series, which lumps the feature in with other 3D Touch operations like home screen Quick Actions and "Peek and Pop" content previews. Multitasking on iOS has slowly evolved with successive annual updates since its inception in iOS 4, but iOS 9 brings more than a generational change to the feature's user interface. Instead of an app icon carousel —which later became app panes —that scrolls from right to left, iOS 9 employs a stacked card interface and switches initial scroll direction to jibe with the mechanics of 3D Touch. To invoke 3D Touch multitasking on iPhone 6s, start an off-screen swipe from the left screen edge as you would a "back" gesture commonly used in apps like Safari and Mail. Make sure to press firmly on the screen while performing the left-to-right swipe action; this is how iOS 9 differentiates multitasking commands from the aforementioned back action. If performed correctly, the UI will drop back to display a series of currently active apps, represented as a set of stacked cards. From this point iOS 9 offers two different options: enter a full-blown multitasking view or quickly switch to the most recently backgrounded app. For example, if a user opened Apple Music to listen to some tunes, then put that app in background to browse the Web in Safari, invoking a 3D Touch app switch would take them back to Apple Music. To enter iPhone's app selector, simply release your finger from the screen when you see the app card carousel appear. From here background apps can be browsed, selected or closed with the usual swipe and tap gestures. To switch back to a recently used app, perform an off-screen swipe while firmly pressing down and continue to move your finger across the screen. The app switch action will be triggered after your finger passes a "hump" in the UI —visually represented by a noticeable undulation in the app card carousel —at about four fifths of the way across the screen. Passing the hump and releasing your finger will open the second app. 3D Touch multitasking can be invoked from almost anywhere in iOS 9, one exception being the lock screen.